Thanks to Nigella Lawson for this one! 1 Pulse the biscuits in a food processor until the texture is a fine crumb. Add the coconut and melted butter and blend again until well mixed. 2 Press the mixture onto the base of a greased 20cm spring-form cake tin, Press down to create a firm base. 3 Chill for 30 minutes. 4 Preheat the oven to 180C. 5 Beat the cream cheese, icing sugar, cornflour, vanilla, lemon juice, and lemon zest together. Fold in the cream. 6 Pour the mixture onto the chilled base. 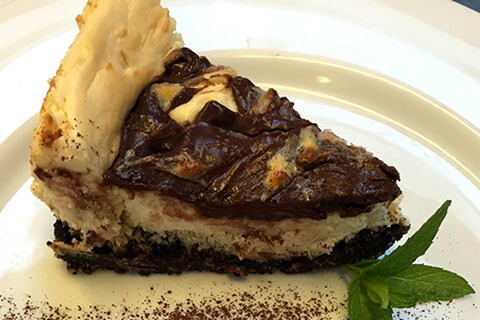 Scoop the Nutella over the top of the cheesecake and, using a fork, swirl the two flavours together. Bake the cheesecake for 15-20 minutes or until slightly wobbly. 7 Cool out of the oven, then chill in the fridge for a couple of hours or overnight.